KODAK POC, AGFA, PACS, OREX, teleradiology, minxray, dynarad, cr tech, portable x ray. 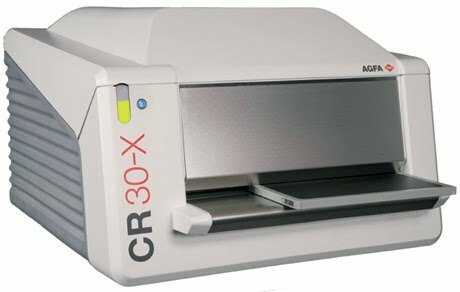 A compact and convenient CR solution, the CR 30-X is easy to install, use and maintain and provides seamless integration, from X-ray exposure to print or softcopy. Flexible and robust, it uses proven technologies to ensure uncompromising and consistent image quality. Uncompromising high quality images. Fast preview and high throughput. Low cost of ownership. Ease of use. And the capability to integrate seamlessly with other systems into a convenient workflow… These are the elements that make the CR 30-X system the intelligent choice for professionals. CR 30-X is a highly versatile digitizer. It offers an ideal solution for any private and decentralized CR environment. CR 30-X can handle general radiology and dental applications. It reads imaging plates at the high resolution of 10 pixels/mm for all image plate sizes.